The main advantages to incorporating in New York are broadly similar to those of other US states. A major benefit for many overseas entrepreneurs is that establishing yourself as a bona fide New York corporation opens up the possibility of getting a US-based bank account. This can improve the running of your business in many ways - for example, the Amazon Partner Program requires all partners to have such an account before accepting them. Becoming incorporated will also add credibility and stability to your company's reputation - consumers are more likely to trust you with their purchases, while suppliers and distributors may be more flexible with their terms. Lastly, when you set up an LLC or corporation in New York, your personal assets will become protected from your commercial activities - your home and personal wealth will be safe whatever happens to your business, which is a welcome safety net for all entrepreneurs. There is no legal requirement for either the company owner or its directors to hold a physical New York state address. C Corps and LLCs must have at least one director or one member, although names and addresses need not be listed in any documents filed to the state. The state of New York makes the LLC incorporation process somewhat more complicated than other jurisdictions, requiring a little more documentation than is usual. Firstly, LLCs in New York must submit an Articles of Organization document containing details of the LLC office. This needs to be followed by a biennial report due in the company's anniversary month. So far so good. However, New York LLCs must also publish a notice of the LLC incorporation for six consecutive weeks in two local newspapers assigned by the County Clerk. After this notification period has been completed, a Certificate of Publication needs to be submitted to the state. However, we can help with all necessary documents and related compliance issues. All New York LLCs must contain the terms "Limited Liability Company" or appropriate abbreviations. The incorporation name must not be identical to the name of any other business entity, unless written consent is obtained from the existing business. For C Corporations, New York allows entity names that include the terms "Corporation", "Incorporated" or "Limited", or their abbreviations. For both types of company, any use of a name suggesting banking or insurance activity requires prior approval from the state. Your choice of incorporation as either an LLC or a C Corp will have an impact on the way your company is taxed. For LLCs, taxation is assessed based on the personal income of the named company members. Limited Liability Companies based in New York must also pay a franchise tax, unless the company is foreign, engaged solely in interstate commerce, and doesn't own or lease any NY property. C Corporations based in New York must pay both business income tax and franchise tax, although the same exemptions to the franchise tax apply as for LLCs. If payable, the franchise tax is calculated at .09% of the business' subsidiary capital. Corporate income tax is calculated at 7.1%. of total net income, or 0.15% of capital, or 1.5% of minimum taxable income, or a minimum $25 tax on the amount of NY state gross receipts. LLCs must contain the terms “Limited Liability Company” or the abbreviations “LLC” and “L.L.C.” The incorporation name must not be identical with the name of any other business entity, unless a written consent is obtained from the existing business. 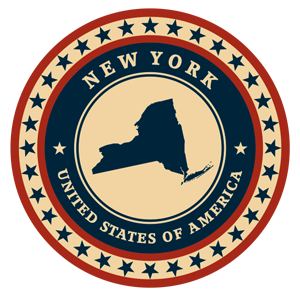 Entrepreneurs looking to form LLCs in New York must submit articles of organization to the state. LLCs must file a biennial report due in the company’s anniversary month. Additionally, New York LLCs must publish a notice on the LLC, for six consecutive weeks in two local newspapers assigned by the County Clerk. Upon completion of this, the LLCs must file a Certificate of Publication with the Department of State. The Articles of Organization must contain the name and address of the LLC office. For more help with the initial corporate filing or with finding qualified registered agent services feel free to contact Inc. Plan (USA). LLCs based in New York must pay a franchise tax. Foreign companies engaged solely in interstate commerce will not be subjected to the franchise tax if the business doesn’t own or lease any property in New York. New York LLCs are taxed based on its members’ personal income. New York allows organization names that include the terms “Corporation,” “Incorporated” or “Limited,” along with their abbreviations. The name must be unique, and if it is similar or identical to a business already in existence then written consent is required from that business. Any use of a name suggesting banking or insurance activity requires special approval from the state. Entrepreneurs looking to form a business in New York must file articles of organization with the state. Businesses must submit a biennial report due during the incorporation’s anniversary month. The Certificate of Incorporation must list a company’s authorized shares along with their assigned par value. Businesses must list the mailing address of the company. Any increase in the share stock will affect the initial filing fees. Inc. Plan (USA) can help you with the necessary filings and also with qualified registered agent service. C Corporations based in New York must pay both a business income tax and franchise tax. Foreign companies engaged solely in interstate commerce are not subjected a franchise tax if the firm doesn’t own or lease any property in New York. The franchise tax is computed at a rate of .09% of the business’ subsidiary capital. Corporate income tax is calculated based on net income at a rate of 7.1%. of total net income, or 0.15% of capital, or 1.5% of minimum taxable income, or a minimum $25 tax on the amount of NY gross receipts.